It is a truth universally acknowledged that as Agatha Christie approached the twilight years of her career the quality of her output dipped somewhat. And yet, as I’ve said elsewhere, what these novels appear to lack in merit from a plot perspective they arguably make up for in a kind of critical self-analysis of her own position in the firmament of crime fiction. And At Bertram’s Hotel, the tenth Miss Marple novel, provides yet more opportunity to potentially read too much into her writing from this perspective. I mean, don’t get me wrong, she’s no Douglas Hofstadter, but who’s to say this is a completely bad turn of events*? So, while by no means a classic or even middle-tier Christie novel (it fared appropriately poorly in Puzzle Doctor’s recent Marple poll), I’d argue that At Bertram’s Hotel can be read as an honest reflection of her failing standing and falling popularity, and much like the two Marple books that preceded it, is deliberately saying far more about the author behind the characters than the characters themselves. For the spoiler-averse I should say that there’s virtually no discussion of the plot herein; one very slight element it mentioned at the end of this post, but you should be able to read this and then go on to the novel without anything having been ruined for you in advance. In fact, I’d love to know if anyone reading it after this sees the same things I’m talking about here – let me know either way! By 1955 it looked precisely as it had looked in 1939… There had, of course, been many other hotels on the model of Bertram’s. Some still existed, but nearly all had felt the wind of change. They had had necessarily to modernise themselves, to cater for a different clientele. Bertram’s, too, had had to change, but it had been done so cleverly that it was not at all apparent at the first casual glance. Replace “hotel” with “authors” and “Bertram’s” with “Christie” and you could easily be reading an academic paper on her writing career – still even now turning out her classically-styled murder mysteries, a once-resplendent subgenre now beginning to show signs of wear, and working in more up-to-date concerns like drugs and crime rings and even a mention of the ‘long-haired Beatles’ (now there’s a crossover no-one needs to write…). And, of course, people flock to Bertram’s precisely because it provides what they seek – like ‘you had re-entered a vanished world’ – runs with clockwork efficiency, and is staffed by familiar faces…in the same way Christie sold novels by the wheelbarrow-load clinging to a model of crime writing that had kept her going for 40-odd years with only minor tweaks, filling her books with stock characters that were familiar almost at first glance (though that particular criticism has always struck me as a trifle harsh). In these ways, Bertram’s is Agatha Christie. And then, perhaps most surprisingly, Christie herself – through Jane Marple, the elderly lady detective standing in for the elderly lady author as established in The Mirror Crack’d from Side to Side and A Caribbean Mystery – doesn’t like it. Miss Marple is drawn to Bertram’s out of a childhood – some might say childish – memory, and then finds herself so firmly locked in the past that it unsettles her. This lack of progress, this pandering to the requirements of the clientele who have kept the place going precisely because it is unchanging as if trapped in amber, troubles her (and, before we get too deep into this, yes it also forms the basis of the plot). But then Aunt Jane finds herself later caught on the horns of a dilemma: visiting her youthful haunts around London, she finds grand old houses divided into flats, or in the case of a distant cousin’s once-beautiful home, that ‘a vast skyscraper building of modernistic design appeared to have arisen’ whereupon she shakes her head sadly and declares grudgingly “There must be progress, I suppose,” as if singularly unable to make head or tail of this necessity. We are aware, of course, of how Christie felt about Poirot by this stage, writing him purely because her clientele demanded it, and so more than a little put out by this need to stick where she’d always been. The odd flourish here and there – the perfume of modernity dabbed beneath the ears with, say, the setting of Hickory Dickory Dock or the central enterprise of The Pale Horse – couldn’t fully reinvent that which was not desired to be reinvented. Whether reinvention was within her capabilities…well, we’ll come to that, but it would have been in the air: Truman Capote would explode the crime novel this year with In Cold Blood, and proceedural Scandinavian miserablism would rear its head with the first Martin Beck novel from Maj Sjöwall and Per Wahlöö; the previous year had seen the literary birth of Travis McGee and the publication of Jim Thompson’s masterpiece Pop. 1280…a shift was well and truly underway in crime fiction (we’ll ignore the wider social issues, precisely because they didn’t ever impact on Christie’s work…take out the Beatles reference and this could easily be 1939). And if there must be this progress, what’s to be done about it? It has to be regretfully noted that she did not avail herself of the wide cultural activities that would have been possible to her… What she did visit were the glass and china departments of the large stores, and the household linen departments, and she also availed herself of some marked down lines in furnishing fabrics… She went to places and shops she remembered from her young days, sometimes merely with the curiosity of seeing whether they were still there. And, of course, in many cases they aren’t – this world she looks for has gone, and the one element that hasn’t changed causes her trepidation. She is a woman out of time, aware that the world she represents and has come from is no longer really a part of the world she inhabits and clearly out of touch with the current artistic mood. There’s an honesty in that which mustn’t be overlooked – Christie could no more write your typical 1960s crime thriller than could Aunt Jane move to New York and dress up like a bat to fight injustice – even if there is also the argument that Christie has placed herself into this corner by a) not diversifying appropriately during the more prolific part of her career and, crucially, b) by writing the final Marple and Poirot novels some years earlier and so effectively committing herself to those characters and that style of novel for the duration. I agree, At Bertram’s Hotel certainly isn’t a complete bust and as you said it does have some redeeming features. 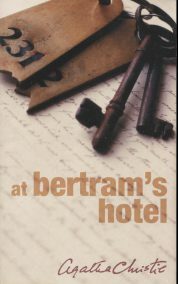 I not only liked the atmosphere and descriptions of Bertram’s Hotel but Bess Sedgwick and her adventurous spirit, especially the stunt that she pulls towards the end. It’s one of the weaker entries and it’s by no means a perfect Christie book with Miss Marple. A Murder Is Announced is more top-tier. It’s been quite a while since I’ve read At Bertram’s Hotel but I don’t believe the quality of the writing was wordy as Nemesis which had a great plot and interesting characters but the book could have been edited and tightened a lot more. Haven’t gotten to Nemesis yet, but I agree that the writing here is actually pretty good. The plotting may be a bit loose, but the atmosphere and the set of characters encountered really us very good indeed. Glad someone agrees! Great post JJ! Still chuckling at the mental image of Miss Marple becoming batman (not a continuation novel I expect to see any time soon). I think out of the remaining novels after this one, my favourite is Nemesis (which is also controversially my favourite Marple novel), as the aspect of looking back is fused effectively with the central crime Marple is investigating. Rather enjoyed Sleeping Murder as well, though of course that was written much earlier. Having been told from viryually day 1 that Christie’s later books were terrible, I find it interesting that no-one ever really made that much of a comment on how interesting they are. I guess you have to read over 60 of them to look for the interest, I suppose! And the Marples have definitely got a lot more interesting in the last three or so up to this one (as you’ve just pointed out with 4:50 from Paddington). Having a later Marple as your favourite strikes me as no particular surprise in that regard – I’m a huge fan of The Mirror Crack’d… because of what it does alongside the plot, so I completely understand. Now very much looking forward to Nemesis, since you rate it so highly…! I think it was just during Puzzle Doctor’s Marple poll my love of Nemesis was deemed peculiar. The Mirror Crack’d is a good one though. I look forward to more of your thoughts on later Christie novels. I love murder-in-retrospect mysteries and Christie wrote a number of them quite successfully and Nemesis is definitely one of them. It’s one of Christie’s great later books but it’s by no means perfect. The plot and the mystery are original and the characters are interesting but the writing bogs down the book. The writing is pretty wordy and repetitive in some spots and could easily have been edited and tightened. Another flaw –what I feel is one– is the murderer is easily exposed during Miss Marple and Archdeacon Brabazon’s conversation, specifically what Brabazon said. Maybe I’m saying this now because I already know whodunit but when I the conversation I wonder how anyone can’t guess the murderer or some of the solution — if not all of it. I guess Christie did this so she wouldn’t come across as cheating the reader but I think she shouldn’t have been so direct as she had. She should have been more subtle. Nemesis is still a great book, but if there was more editing it could’ve easily been one of Christie’s best later mysteries and referred to by critics and fans as such like The Pale Horse and Endless Night. Good post – my view is that this one, along with ENDLESS NIGHT and BY THE PRICKING OF MY THUMBS in particular offer fascinating insight into an author discussing their advancing years and a return to their childhood and the memories from that time, and some awareness of the perils of doing that. After those the books are pretty disastrous though – POSTERN OF FATE is just awful and very sad to read. It could say that POSTERN is potentially touching but it is like spending a lot of time with a really sick relative – you still love them, they are still themselves at least part of the time, but deep down you know that the end of them can;t be far away and it makes it all so hard knowing this. That’s actually quite a lovely way to think about it, Sergio. With ten novels and two collections left I probably have another two years of Christie to go…by which point I’ll have been reading her for 19 years. If you’re not one of the family after that much time, you never are. There’s certainly a lot that can be made from these later books, it appears. I have no desire to foist upon them an interpretation that isn’t there to be seen, but after her many successes I can’t believe she woldn’t have known these were to be weaker books and that wouldn’t have found its way into them somehow. I agree that Postern of Fate is dreadful as a crime mystery – I’m a huge Christie fan and have read it a few times but still cannot make sense of the plot. However, it is an interesting read in one way; the descriptions of (I think, from memory) Tuppence’s childhood are closely based upon Christie ‘s own- she didn’t even change the names. The house Tommy and Tuppence buy is the house Christie grew up in. It compares closely with the relevant sections in Christie’s autobiography and makes this published evidence of her sharp decline all the sadder. I do think that Christie spends much of her later career dealing with her feelings about growing old. She was pragmatic enough to know that change must come even if it’s substandard change (housing developments in St. Mary Mead, shops giving way to skyscrapers in London), and the cleverest thing about Bertram’s is how Christie plays with her generation’s desire for nostalgia. Yet, after a wonderful opening chapter where we relive the grandeur of the old hotels with their delicious high teas, the plot becomes an absolute mess. I’m not sure it’s Christie’s failed attempt at a 60’s crime thriller because she has crafted much more effective thrillers before. Pale Horse accomplishes all she set out to do, merging the old with the new in a really brilliant way. The real mystery in this novel concerns what’s going on at the hotel, and it turns out to be halfway clever/halfway ridiculous. All the murder plot is just ridiculous. I still can’t remember why any of the victims were murdered because none of these people ever mattered to me. This was fun to read, JJ, but I’m dubious here . . . sometimes a conked-out Canon is just a conked-out Canon! If you don’t hate me for this, I’d like to share two more things. First, a personal anecdote: it was New Year’s 1986, and I was in London for the first time. I had only a day or so left of my trip, and I had yet to have a high tea in a fancy hotel, which I thought all tourists should do. I left my host and went out to shop. Found Harrod’s and bought a raincoat (which I have to this day) and then wandered the streets, somewhat lost and confused. It was very cold and snowing lightly, and I began to feel like a man shipwrecked on a desert island despite the crowds, become more disoriented as I stumbled along the streets. And then, before me, I beheld the entrance to the Dorchester Hotel. (That’s the one with the pink marble columns, right?) This had been recommended to me for tea, and so I shuffled over to the door, my hands clutching shopping bags, my clothes damp from the weather, only to have a doorman whisk me into the hotel, grab my coat and bags and head me to the area where they served tea. Gently but efficiently, I was deposited into a high, comfortable chair. I don’t think there was a fire, but it was marvelously warm. I was served sandwiches, scones and cake with plenty of hot tea, and I spent a dazed hour just munching and relaxing. It fortified me enough to make it back home! The second share has to do with old hotels, for it just so happens that my niece works for a brand hotel in Seattle, one of the Fairmont Hotels. They are definitely considered a “classic” brand, and most of their clientele are older. The lobbies are huge and elegant, with high end shops and old world-style restaurants. It definitely caters to a certain age range, one that is sadly dying off. In the Seattle hotel, they are renovating, and my niece is dismayed to find that they are trying to bring in younger people (those who would more likely be found at the W hotels) by stripping down the elegance and bringing in a starker, more modern style, with cheaper, shinier embellishments. Who knows if it will work or not, but it seems a shame that a certain old-World style is dying off when it doesn’t have to. The point I’m making is that I think Bertram’s had a point in maintaining the old ways. The fact that they did so excellently did not have to pique Miss Marple’s suspicions. It COULD have been a marketing ploy. To be honest, if I had the wherewithal, I would have stayed at the old Bertram’s to get a sense of how hotels used to run. Too many modern hotels are completely lacking in service. Sorry to run on so long! Bah, nothing to apologise for, Brad – delighted to think I’ve inspired this much of a response from someone! I will concede – and I didn’t make this clear in this post, it’s true – that I’m not saying all the later Christies are chock-full of meta analysis, but there’s arguably something about the old lady detective and the old lady author who has finally caught up with her that would inspire a certain amount of reflection. Some of these later books will simply be poorly written: The Clocks, coming between The Mirror Crack’d and Caribbean Mystery, is nowhere close to those books in terms of reflection or reminiscence…whether that’s because she was just dashing out another Poirot or because that vessel doesn’t lend itself to such schemes remains to be debated in perpetuity. However, these weaker plots in the Marples may not seem so weak to her because she was using those books for another purpose, so they feel like better novels in achieving a different purpose… Hey, I’m not trying to excuse them, but I can’t believe she wouldn’t be trying to work in something a little different after 45 years of writing and knowing that the end must be on the way. We shall, however, never know. Do you think ‘At Bertram’s Hotel’ would have fared better as a book if there wasn’t a murder at all (like in Gaudy Night by Dorothy L. Sayers)? All of Christie’s novels have a murder; I know for certain that some of her Parker Pyne stories and one Poirot short story, “The Case of the Missing Will” didn’t have a murder at all. Sayers’s Gaudy Night doesn’t have a murder and is regarded as her best books — her magnum opus, so I wonder why Christie didn’t write a novel that didn’t have one as well? At Bertram’s Hotel could have easily been one of them. Yeah, but what would you have ended up with? That ridiculous robbery plot! The problem is that the only connection between the conspiracy and the murder plots is Bess Sedgwick, and it’s a clumsy connection that doesn’t mystify OR ultimately enlighten. I think Christie had a marvelous germ of an idea here: nostalgia for the past can blind yo to the pleasures- and dangers – of the present. But the muddling of her plotting powers seriously weakened the result. Personally, I would have felt cheated without a murder, but THESE murders were uninteresting. If Christie wrote At Bertram’s Hotel in her prime, the book would have been more tightly plotted, though I do have to say that some of the characters and the writing descriptions of the hotel atmosphere are interesting to read and are well-written. Though her plotting powers weren’t as tightly constructed as in her early years, she still had the power to come up with interesting premises and germs of ideas. Though perhaps they lost steam, you’ve got to admit her imagination and creativity were still there. Well, it makes sense for Bess Sedgwick to be connected to the robbery plot. It fits within her character, considering that she’s adventurous and game for anything. At the risk of repeating myself, Christie wrote wonderful descriptions of the hotel. They made me feel nostalgic. They made me want to go to Bertram’s..
Third Girl: Honestly, I have tried to like this one more. Mrs. Oliver figures prominently in it, and that’s always a good thing. You have the sense that Christie is still working hard to put together a complex plot, but the characters are so unlikeable and the sense of Carnaby Street is so unbelievable, that it just doesn’t work for me. Endless Night: I do think that Christie is in her full element here and that she plots and writes this with authority. I just don’t happen to like it very much, and the world seems to be divided into two camps on this one. By the Pricking of My Thumbs: Great beginning and end, weak, meandering middle. I happen to like this one very much for the chance to see Tommy and Tuppence again and for a really cool ending. But it does take patience in the middle…lots of it. Hallowe’en Party: GREAT beginning! The whole opening party is wonderful. But then it just feels like a lot of blah, blah, blah until the end, and a lot of old ideas are revisited in a sort of half-assed manner. Nemesis: I don’t like this one nearly as much as Kate. Sometimes it feels as uneventful as I imagine a Tour of Great Gardens WOULD be. But it does evoke a powerful sense of nostalgia for this Miss Marple fan, even though the opening only stretches as far back as A Caribbean Mystery. And it does have a great murderer and motive. Elephants Can Remember: This is interesting to read ironically in order to see just how bad it really is. Compare it to Five Little Pigs where another young woman can’t be happy until she learns the truth about her parents’ death. Only FLP is brilliant, and this one is so full of continuity holes and ludicrous elements that it becomes laughable – which is exactly what Christie DOESN’T want it to be in the end. Curtain: How lucky we are that the author saw fit to write Poirot’s swan song at the height of her powers. It will never come close to being my favorite Poirot, but it is a truly nostalgic piece, not only because it takes place at Styles Court, but because having Hastings narrate brings Christie back to the way she wrote in the 20’s and early 30’s. Since about Three-Act Tragedy or so, by which point I was fully prepared to commit to everything she wrote, I’ve been reading Christie chronologically, yes (apart from the two posthumous collections, which I’ve already done. All that remains is the books up to and including Miss Marple’s Final Cases, and I have no doubt there will be some decided chaff in there! I really appreciate this summary of them, and shall refer back to it again with each one I tick off…so expect further exploration of these points. Someone paired Joan Hickson with Miss Marple and treated THOSE adaptations with love. They are the gold standard. I haven’t had much luck with the short stories with Suchet; they seem padded. I liked the novels, for the most part, until Suchet became a producer and demanded changes. The last season, except for Curtain, was dreadful. As for the new generation of Marples, one of you Englishmen will have to explain that to me someday! I understand the money issue, but why was there no attempt to be true to the author??? Would that have been so difficult? David Suchet was in part repsponsible to the changes to the later Poirot TV episodes? Of all the people who should understand the integrity of the source, surely he’s top if the list…. Mine, too! Evidently, Suchet, a staunch Catholic, wanted to play more of the spiritual conflict Poirot felt over his cases. Except HE NEVER DID!!!! That’s why people get mad at the Suchet version of Orient Express. Still, that doesn’t explain the attempt to “improve” Elephants Can Remember, The Big Four, and Labours of Hercules in TV! Bah! Well he can bloody go and play Father Brown then, can’t he? Having seen the first programme of the new Miss Marples (sorry, MARPLE), I wandered around the house in a daze clutching my head and muttering “They changed the murderer. Why? Why did they do that?” and it is my proud boast that I have not watched any of this appalling series since. Joan Hickson was far and away the best Miss Marple on TV and at least they remained more or less true to the original plots. I was not aware that Suchet had become a producer on the later Poirots but maybe it explains a lot. The last series of films was truly dreadful, with the exception maybe of Dead Man’s Folly; at least we got a good look at Greenway, where it was filmed. I always thought they should have filmed the stories in The Labours of Hercules as individual programmes, as they did with the earlier Poirot short stories; but maybe the budget didn’t allow, or maybe they just wanted to finish the series and have done. I know that by the end of it I certainly wanted to! I agree with everything you say! Curtain wasn’t bad either, but the quality of the last two series of POIROT was pretty substandard. What MARPLE did to Body in the Library should have warned me . . . The Poirot TV series fell apart disastrously after 2001 when they got a new producer, in my opinion anyway. But then British television as a whole started to fall apart at around this time. Brad, I believe that in order to adapt the Poirot short stories to 50-60 minutes episodes, they have to be padded somewhat. Mind you, some of the padding is ridiculous and some of it was well done. The Poirot series with Suchet was by no means perfect but I’ll take the padded short stories over the ridiculous changes that were made in the later episodes of the novels which were unnecessary. Of the later episodes, I think the best ones were Five Little Pigs, The Hollow, Sad Cypress, and After The Funeral. I would list Halloween Party and Three-Act Tragedy (it could have been better) as Honorable mentions. I think Curtain could have been better. I think it should have been a longer episode; I didn’t feel like I got to know the characters that much. I love the scene when Poirot and Hastings meet once again but things go south as Poirot treats him so meanly. Honestly, the adaptations of Christie’s books veer off unnecessarily away from the original material and I fear that it’s going to stay that way. When I hear of new adaptations I’m not excited to see them because I already know the bastardization that will be done. So I watch the old adaptations and remain with that; there are plenty of good ones out there to watch. The Poirot series with Suchet was by no means perfect but I’ll take the padded short stories over the ridiculous changes that were made in the later episodes of the novels which were unnecessary.